Johnny Franco began his own aesthetic medical practice: More Beautiful You. He was known as one of the best surgeons in Miami and followed the growing market here in Texas.He needed a new logo and website to launch his new Austin, TX office. A style guide is used to define all visual aspects of a brand. 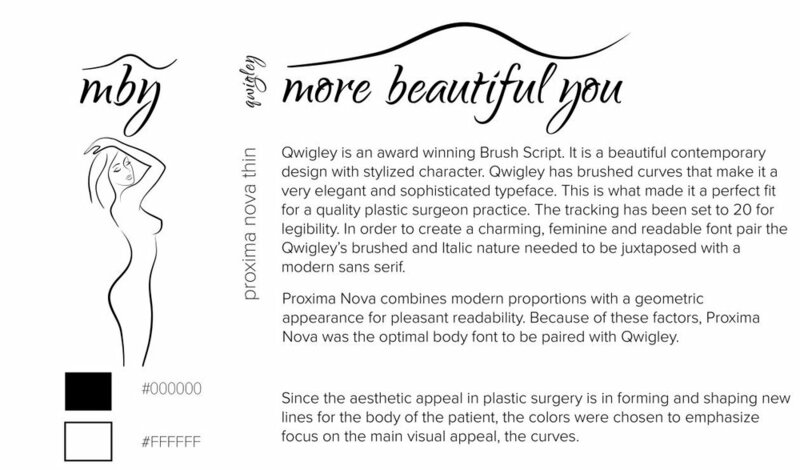 I picked and matched specific typefaces to communicate the feel of luxury and beauty. I made the color palette simple to let the focus remain on the aesthetic appeal, the lines and curves of the logo. I then expressed the style guide in multiple mediums, from sign-in books and letterheads to sleek business cards to tie together the luxury of this brand. With a website spanning more than 80 pages, we had to make sure the website navigation was simple and even the most distant information was only a few clicks away. I built a custom menu for the site navigation. Separating the female body into multiple parts which I used as the basis for categorizing Johnny Franco's services; all while being HIPPA compliant.